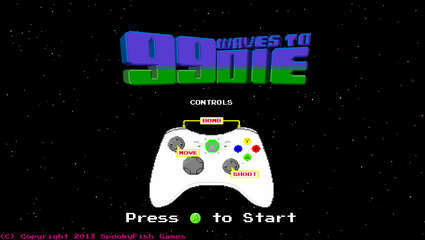 99 Waves to Die is a twin stick arcade shooter, inspired by the arcade games, and 8-bit home consoles & computers of the 1980's. Remember when video games used to be insanely difficult? When you used to spend $’s in the local arcade trying to get the high score? When having your three letter initials/acronym at the top of the table meant you were the king? Well we do, and that is why we have created 99 Waves to Die. A ship, 3 lives, limited smart-bombs and scarce power-ups is all you have to try and survive the waves of enemies that rally against you. With voxel based graphics, inspired by 80′s video game classics & excellent 8-bit audio fx, 99 Waves to Die will take you back to those seedy, dark, smoke filled arcades of your childhood. Re-live the 80′s heyday of the arcade, but without the quarters. Can you survive to see Wave 99?